In celebration of the 420 holiday and just for the love of nachos we've repurposed the pork rind in an unimaginable to create these Pork Rind Nachos! The pork rind chips are dense, cripy, salty and perfect for holding all the essential nacho toppings like a chip. 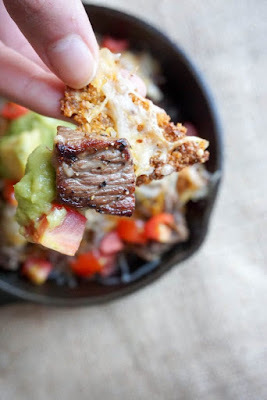 We've seen many people make keto nachos using normal pork rinds, but we wanted the real feel of eating nachos because there is no better munchies snack! Break cheese up into chunks and add it to a food processor. Add pork rinds and pulse together. Add seasoning to processor and pulse until fully combined. Pour out mixture onto a greased baking sheet or parchment paper and flatten out as thin or thick as you like. We like to keep ours a little on the thick side. Bake for 5 minutes at 450 degree Fahrenheit. (Keep any eye on them as to not let them burn since ovens can vary in cook time!). Remove from oven, cut into preferred chip shapes and bake for additional 10 minutes at 400 degrees Fahrenheit. (Keep any eye on them as to not let them burn since ovens can vary in cook time!). Remove and allow to cool. Layer chips onto a plate or skillet. Layer on cooked meat and sprinkle with cheese. Place into an oven on broil or into a microwave and remove when melted. Keep an eye on it so the cheese doesn't melt. Add the guacamole and tomatoes, and enjoy! 0 Response to "Pork Rind Nachos"